On Friday evening, November 11th, the Rocori Varsity Football Team will be playing in the 4AAAA quaterfinals of the State Football Tournament. Entering the Section 8AAAA tournament, Rocori was the No. 5 seed with a record of 3-5. It beat Detroit Lakes 25-0 in the quarters; #1 Sartell 19-15 in the semis and #3 Alexandria 8-6 in the finals. In other state 4AAAA quarterfinal games, Totino-Grace faces Hutchinson, Princeton faces Holy Angels and Mahtomedi will face Lakeville South. With a win over New Prague on Friday, Rocori would advance to the semifinals a week from this Saturday (Nov. 19) at 5:45 p.m. against the winner of the Mahtomedi/Lakeville South game. 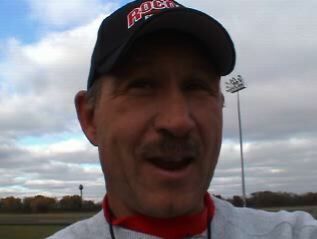 Interview with Rocori Varsity Football Coach Rick Theisen after the Saturday upset win over the #1 Section 8 seed Sartell Sabres. 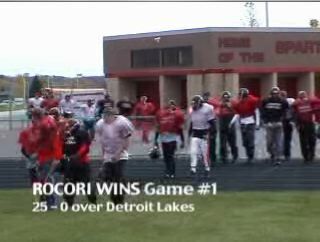 After 26 years of Rocori football involvement and the past 5 years as head coach, how does it feel to get a win like this against the #1 pick in the sectional tournament, a team that you lost a heart breaker to just two weeks ago? victories I've had the opportunity to be part of! I am so proud of our 13 seniors -- especially how they have bonded the entire team over the past few weeks." So what was the difference last night in your win over Sartell vs. the results a few weeks ago? So was this a fluke? How far can this team go with their newly found destiny? aspects of life, efficacy will usually pay off -- the boys BELIEVE IN THEMSELVES NOW -- it's just their time to shine"
You'll be playing Alexandria this Friday in Fargo, who you lost to back in September, how will you prepare for this team differently than last? certainly won't take them lightly, they have an excellent program"
Would you call this team a Cinderella team? "Probably, we've certainly have been the underdog and that's OK; initially, we felt a 4-4 regular season would be a good step forward considering the inexperience we started out with". But, you know, our present seniors had been able to rely on some great players from last year's grads. 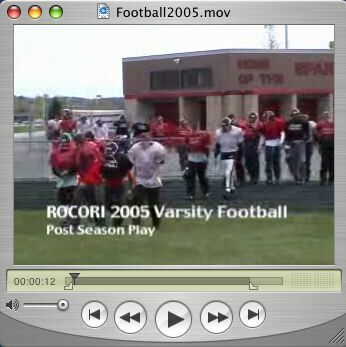 I think its just taken them some time to figure who they are and what they wanted their legacy in Rocori Football to be"
these guys on our staff." It was only two weeks ago that the Rocori Spartans suffered a character building loss to the Sartell Sabres when they fell short in the final four seconds 28-24 during homecoming. The tide changed last night when the Spartans traveled to the Sartell football field in the Class 4A, Section 8 semi-finals and beat the Sabres 19 to 15. The Spartans will now travel to the Fargo Dome to take on #3 seed Alexandria in the Section Finals on Friday, November 4th beginning at 8:00 PM. This will be an exciting rematch between these two teams. It was back on September 16th when Alexandria visited Cold Spring and rode away with a 21 to 13 victory. Rocori will be up for the challenge and will continue their Cinderella season to a possible birth in the Class 4A State Tournament. Did you hear the news? Last night, the ROCORI Spartans Varsity Football team, the same team who had been struggling all season long, won their first playoff game Detroit Lakes. They shut out the opposition by winning 20 points to 0. Watch this story to find out how the coaching staff and the team leadership has used the lessons of the season to put it all together in the post season. 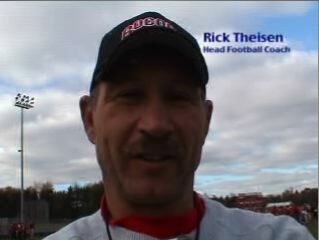 Meet Coach Rick Theisen, the team captains and all of the varsity football seniors. 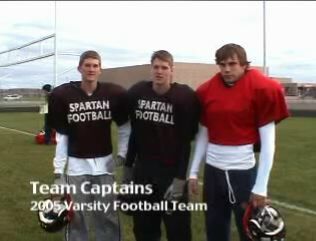 The Rocori Spartans travel to Sartell on Saturday, 7:00 pm, to face the #1 team. 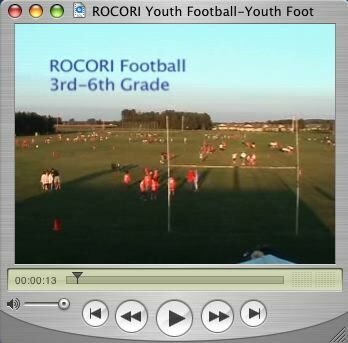 You'll recall Rocori lost the first game with Sartell a few weeks ago in a nail biting back and forth battle. Sartell ended up winning in the last few seconds of the game 28 to 24. This should be a great game, be sure to get out and support of fighting Spartans.